Drivers fee 100$ to register please contact me by text/call 515-249-9531 message me on facebook or email devrien1@gmail.com. We will need your Name, car, and contact information. Once confirmed you will be included to the drivers list. For payments we are currently doing paypal or cash, this needs to be paid by the end of the day on the 18th. There will be no refunds so if your car breaks the day before and you can't make it you're not getting your money back. Pay with cash with any of the listed hosts. Any questions please post on the thread and I will get to them as quickly as possible, i ask that you post them on here so others can see. Drivers will need to arrive between 7:45 and 8:15, registration/tech will be from 8:00 to 8:45 drivers meeting will follow at 8:45 and course will go green at 9:00am. As long as everything goes well we plan to have drifting continue till 4 or 5pm with an hour lunch break around noon. As far as safety goes we are still working on getting the exact details on what will be required. For the time being I ask that you prep your car and yourself as if you are going to an AutoX event, that means a proper helmet, your car can't be taking a piss everywhere, and none of that janky crap. You better have each and every one of your lug nuts and that battery best be strapped down. Also facebook users, please like Angle Junkies, and JB Autosports to show your support. I would also like to give a shout out to 515 Customs (Joe Rosenberger). If you need a cage or custom fab work give him a call at 515-229-6900 he is also a parts dealer as well. Last edited by Dj Technick; 10/18/2012 at 08:54 AM. X2.. would love to watch.. keep us posted on this! More car events, id come and watch for sure. A couple of us are working towards setting up a local drift event, right now we are looking for some support to see if this is something we can have or not. As of right now the location is looking like it'll be the Oskaloosa Airport, same place auto x is held at. Looking to see if anyone has interest in attending or spectating. We would like to have something started here in Iowa and in the future turn this into an annual event with car show included. 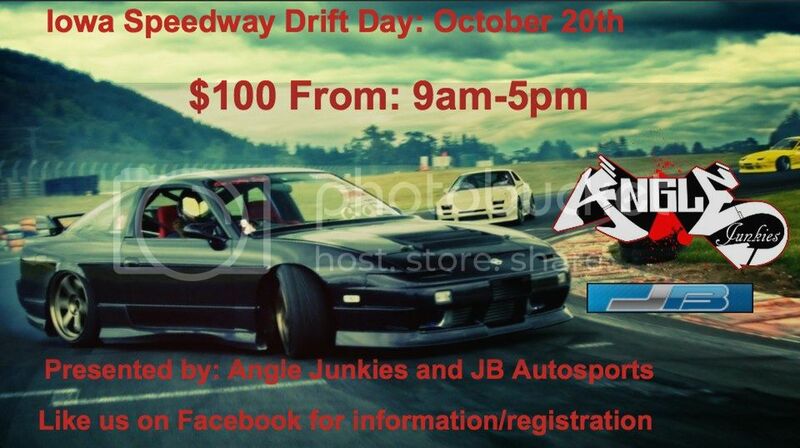 Id support it and I would be interested in some drifting if you guys hold the event. I have a roll-cage and, 5-point safety harnesses and I definely have the power. I would like to see if I have the skill to drift. I'm in to help ! Me and my camera will definetly be spectating. JB and I have been talking about venues and it got me pretty excited and I'm not even a drifter! We have been talking about dates for the event and are still unsure when we will able to hold it. With autocross still having a few events left and also our very first time attack/time trial event for SCCA being held at MAM in October, we are unsure when we can dedicate the time for this at the moment. My fingers are crossed for late October. More than likely, we will be doing a pre-registration and will need the entry fees paid for up front. So, once the interest level has been accessed, we will weed out the flakers and get a real list of who is coming by taking entry fees. Let's see this interest build and I will have registration up. Midwest Exclusive will support this. I've actually looked into setting one of these up already in the past. No shame in that, there were a few people at Proving Grounds that I swear must not have ever driven before and were trying to drift. We all start somewhere. Im sure I wont be the only one thats nevet drifted.. Besides in winter but that doesnt count I hope we get this even goin! Drifting is always fun to watch, I would go! I have been to FormulaD 3 times! Registration is up, sign up ASAP! Alright dudes.. the banner has been created for the event. Get registered! We can do better than this, only 7 people signed up so far? Look you don't have to pay right now, we are just looking to get people registered to see if we can get 20 people and hold the event. I'd sign up...but my car is backwards and there is a solo event the very next day. Maybe encourage people to lend their cars out to friends, (we call them co-drivers or tire warmers in the solo world)...that may increase the numbers and help new-comer's learn the ropes. Last edited by gabebauman; 10/02/2012 at 12:09 PM. You know you all want in on some of this drifting action. Lets get 20 names on that list! I don't want to see this event not go down because people wouldn't sign up. Here's a little bit of motivation for everyone. You pay online before the event. Right now there is no reason to have them pay because we aren't even sure if we can get 20 people. So instead of having a few pay then if it doesn't work return their money we are trying to get 20 people first, then have them pay and after they all pay the event is a go. If they don't pay then it's a no go. There is no paying the day of the event it all needs to be handled before the 16th.